May’s main event for Team PossAbilities was the renowned Redlands Bicycle Classic Para-Cycle Series! This intense four day stage race brings paracyclists from all around the USA who come to show their competitive spirits and battle one another on challenging courses in the prime Southern California cities of Yucaipa and Redlands. The Para-Cycle Series kicks off with a Time Trial, but unfortunately for this year’s 2018 race the Stage 1 Big Bear TT was cancelled due to snow and the inability to plow the course and set it up by start time. Following the TT is the Yucaipa circuit race which is a looping course set in a residential neighborhood and features every kind of challenge from two short but grinding climbs, powerful flat stretches, and exhilarating FAST sweeping descents with white knuckle turns! The Stage 2 Yucaipa race is technical and requires every participant to engage all their handcycle handling skills with complete precision. Team PossAbilities’ own Brett Richards is the 2017 Redlands Para-Cycle Series defending champion and he once again came out on top with a WIN for Stage 2 in the MH3 classification, Alfonso Garibay was a close second behind Brett and Chris Sproule fought hard for his fifth place spot despite suffering a mechanical during the race! In the he MH4 classification Team PossAbilities’ Tavian Bryant came in Second place as did Del Dunston in MH2, and I came in first in the WH3 classification! All around Team PossAbilities secured podium spots in each major classification for Stage 2!!! Stage 3 and 4 of the Redlands Bicycle Classic Para-Cycle Series are long and short course criteriums that take place in the heart of Downtown Redlands and showcases the best visibility of the handcyclists in the heat of competition making a great day for spectators to come out and catch all the fast paced action!!! The cheers and encouragement from the crowds as the handcyclists rip around each tight corner vying for the best line and trying to outdo one another is nothing short of exhilarating and unlike any cycling race you will ever experience! 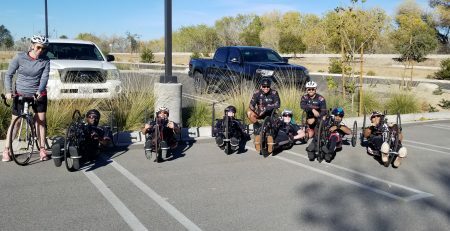 Both Saturday’s and Sunday’s races were held late in the afternoon and the temperatures climbed up into the 90’s during each criterium but that didn’t keep the handcycle and recumbent racers from giving it their ALL and holding NOTHING back. Team PossAbilities’ Brett Richards was determined to keep his MH3 championship title and he DID by WINNING BOTH Stage 3 and 4 long and short criteriums, securing his Omnium Win of the 2018 Redlands Bicycle Classic Para-Cycle Series!! CONGRATULATIONS and a job well done! Alfonso Garibay earned a solid second place in Stages 3 and 4 in MH3 classification, Tavian Bryant took 3rd place in Stage 3 and Second place in Stage 4 for MH4 classification, Del Dunston came in second place in Stages 3 and 4 in MH2 classification, and I captured First Place in Stages 3 and 4 for WH3 classification! It was spectacular to have Team PossAbilities up on the podium during every stage of the Redlands Para-Cycle Series and it definitely shows that we as a team are on the right track to race strong at Paracycling Nationals in Augusta, Georgia this June! !